The State Department has given a face-lift to its Web site that presents U.S. policy toward Cuba. A banner with Cuba's flag sits atop the main page, at www.state.gov/www/regions/wha/cuba. A map of the island appears along with links to other pages. State used HomeSite 4.0 from Allaire Corp. of Cambridge, Mass., as its Hypertext Markup Language tool. The department created the site using a 450-MHz Pentium III Gateway GP7-450 with 128M of RAM, a 13G hard drive and Microsoft Windows NT 4.0, said Anita Stockman, the site's webmaster. The site is hosted on a cluster of Apple Macintosh servers at the University of Illinois at Chicago.  Two 120-MHz 7250 Workgroup Servers with 16M of RAM each, 2G hard drives and Mac OS 8.1. State began revising the Web site in October, building on the existing page maintained by the department's Office of Cuban Affairs. The department rolled out the new site Nov. 8, and it had received more than 21,000 hits as of early December. 'Simply stated, the goal of U.S. policy toward Cuba is to promote a peaceful transition to a stable, democratic form of government and respect for human rights,' said Marthena Cowart, deputy assistant secretary for public information in the Bureau of Public Affairs. 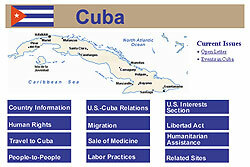 State plans to update all its Web pages and will use the new Cuban Web site as the standard, Cowart said. The site has links to information ranging from travel to Cuba by U.S. citizens to the provisions of the Libertad Act, which was signed by President Clinton in 1996 and calls for democratic reforms in Cuba. 'This Web site is the latest tool in our continuing efforts to explain our policy,' Cowart said.